Today's video is of the super cute Paper Clip Paper Bows. These are so simple and fun to make. I mean REALLY simple! They would be a great gift! You can make them is bulk and send them to a teacher, give them to a co-worker... they are great to spruce up your paper bunches or use them for a bookmark!! Let's go ahead and take a look at today's video! 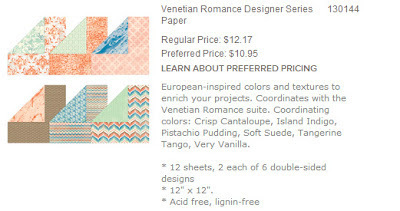 The paper that i used today for my bow was the Venetian Romance. It's a great pack! !